Log cake boxes are made of SBS. Boxes are .024 SBS locking corner taper top with .00125 polypropylene window (covered or open). Top fits two ways, flat or barn style. Barn style can take special cake sizes & shapes and cakes needing higher top, not only ice cream cakes. Window is top and front. These boxes can be post-printed on the back (opposite of the window) 4 case minimum. Two piece construction of SBS board. Can bake 16-18 oz. in 350-375 heat, serves 6 slices per pan. Cover is simplex style construction with pull back tabs that sit on the bottom. Bottom tray is made of ovenable board in simplex style construction. 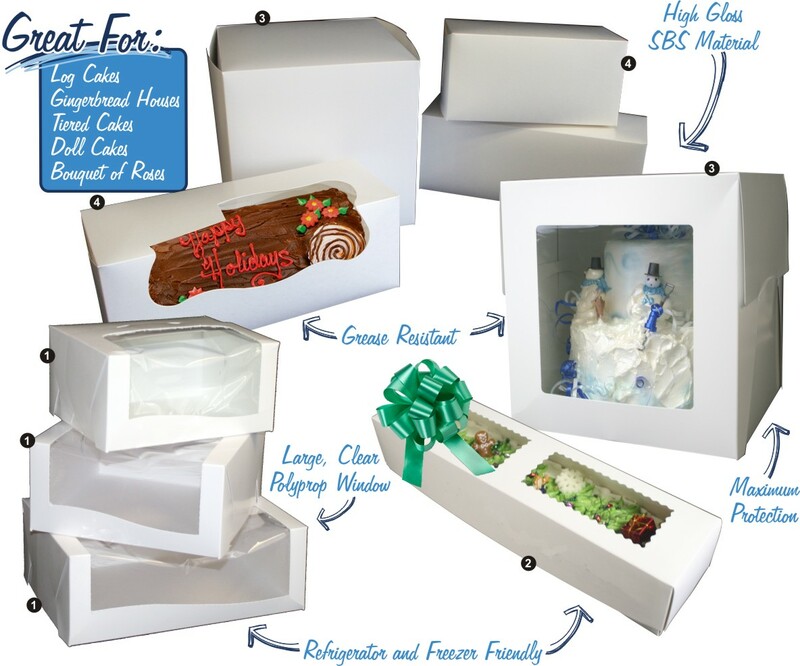 Made of SBS, Tall Boy boxes are perfect for high decorated cakes or gingerbread houses. Mini-sheet cake boxes are perfect for 1/8 sheet cakes on a pad or foil pan. Heart cakes fit any 10 x 10 x 3" (single layer) or 10 x 10 x 5" (multi-layer) box.